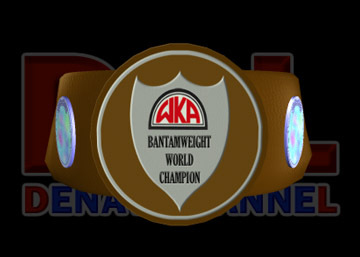 become the first-ever WKA (World Kickboxing Association) Bantamweight World Champion. impressive record: 13 wins (2 by KO), 1 loss, and 2 draws. Nevertheless, age and weight as well as training will also decide the outcome. the FH-Gym in Paris. Who will add tonight’s win and the WKA Bantamweight World Title to her fight? and gratitude from the majority of fans’ support, and raises her blue-gloved fists in the air. The blond French is also wearing red foot guards, white shorts with red trim, her name, and her home city of Paris, and red bra. Sophie gets into the ring and walks to her corner, while the announcer announces the match. Finally, the referee finishes reading the rules, and the two stunning women nod, still staring deeply into each other’s eyes. her pink gloved shield, but the punches are too many and heavy for her to stop, and she desperately clinches with the blonde. Alexa raised her guard against the jab. The dark-haired warrior winces in pain. Sophie to reach her. Sophie Girard sees this, and thinking it is the opportune moment, charges forward with a right jab. She is caught by a big push kick to the abdomen and is propelled backwards, the air squeezed out of her lungs by that kick. of her opponent’s head blocks it. the count of 3, allowing Sophie to rest and recover until the next round. with merciless blows. She kicks the inner thighs and punches at the abdomen and breasts, causing loud slaps and gasps from Sophie. the blonde’s head to the left. and launches a hard right jab to the abdomen. Alexa gasps for air as most of the oxygen leaves her lungs. Sophie tries to fire off a left jab, but barely misses and receives a solid kick to the side. signaling the end of the round. against the ropes, allowing her opponent to sink her right foot deeply into her left breast. a right kick to the left side of Sophie. Glad for the bell, both weary fighters walk back to their corners. but Alexa dodges and lands a kick to the back of Sophie’s right knee. Alexa continues her attack and sinks a left glove into Sophie’s right cheek. She wobbles from the kick, nearly falling, but saved by the bell again. It seems that the 80% of the audience may be wrong. By this time, everyone is gripping and on the edge of the seats. ignoring the knee to her stomach. With all of her remaining strength, Sophie pushes Alexa away from her. The Italian returns to the tired blonde. Sophie attempts a kick to the midsection of “The Warrior”, but misses, and instead, is struck by a solid, high, right kick to the face. The referee counts her out and the triumphant Alexa raises her pink gloves in satisfied, joyful victory. in recognition. Sophie Girard was downcast, as are most of her fans. The two Europeans hug, praising each other’s power and toughness, in a sign of great sportsmanship. Then, the waitress and Alexa posed for the press. Alexa “The Warrior” Berti’s updated fight record: 18 wins (5 by KO), 2 losses, and 1 draw. Sophie Girard’s updated fight record: 13 wins (2 by KO), 2 losses, and 2 draws.